I'm sure you've all heard of the RC2014, it's a modular Z80 computer system available from seller 'Semachthemonkey' on Tindie. 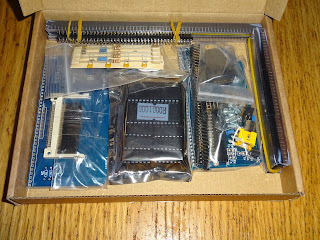 A great little system that makes it easy to build and expand a Z80 based system. 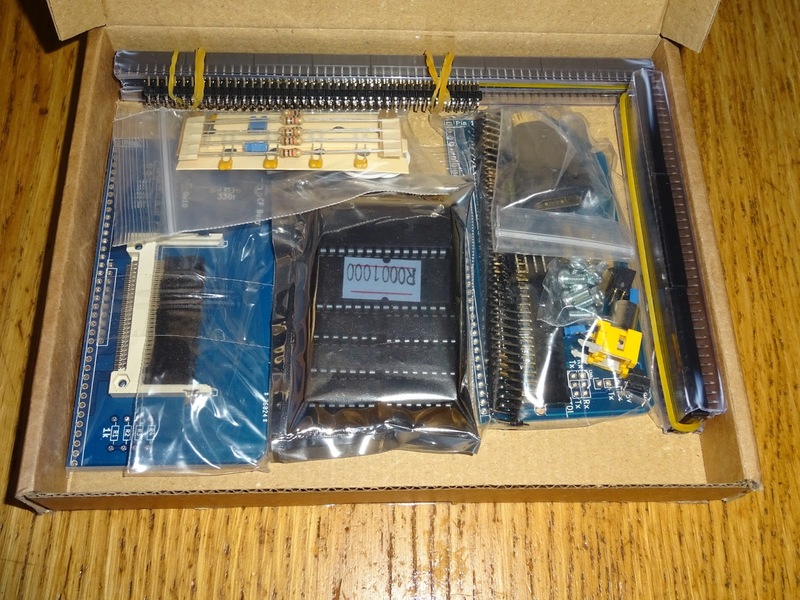 (or even a 6502 system as the base is very adaptable). 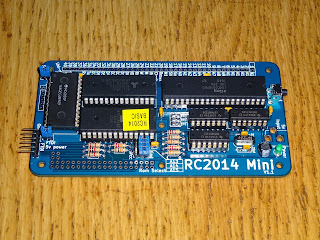 I've just bought some new boards to add to my RC2014 system, so I thought it would be a good time to revisit the current system and go through all the boards on there before I add the new ones. The system is based on a backplane with a common bus, 40 pins wide, carrying most of the Z80 lines. It uses 40 way 0.1" sockets for the modules to plug into. This is the 'back plane - 8' model where slots 1 and 2 and slots 7 and 8 can have their address and databusses isolated from the main slots, 3-6. 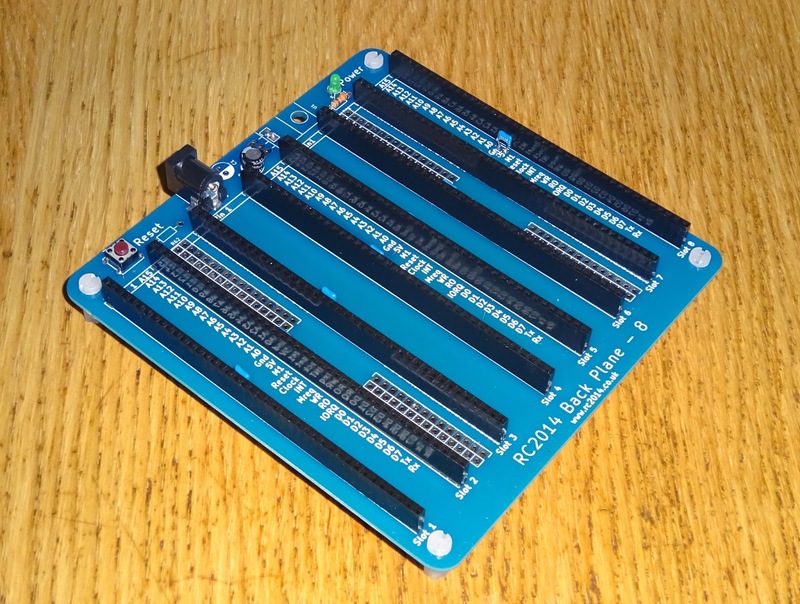 This will allow some protection on the bus via resistors or to use split address and databusses for some cards to create ZX81 or ZX Spectrum type systems where the busses are isolated to simplify the screen generation process. Into the backplane plug a selection of modules. 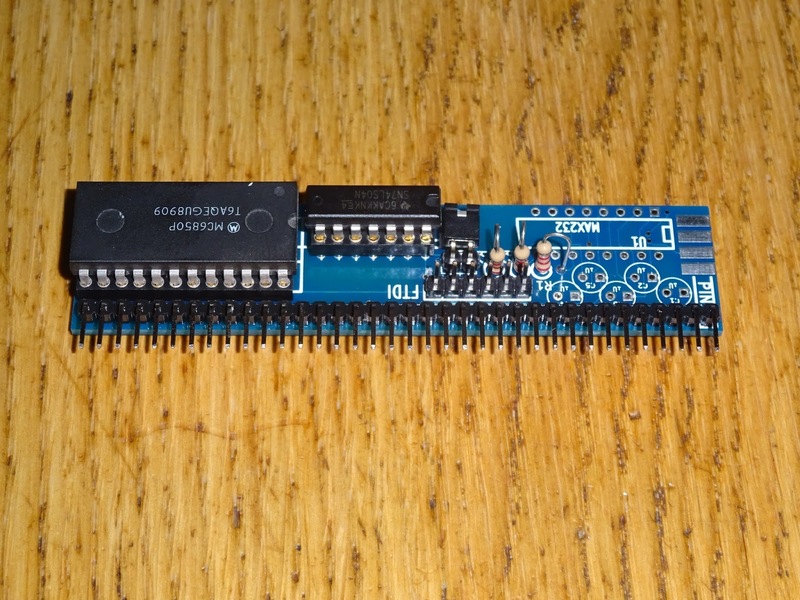 Most are less than the full 40 pin width, and all align with the top of the backplane, pin 1, with the exception of the clock / reset module which hovers around the middle. 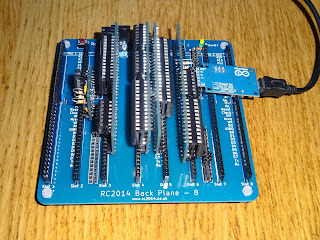 Full details of the backplane and other modules can be found on the rc2014.co.uk website. 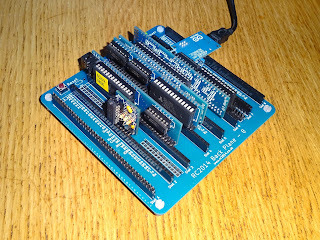 The heart of the system is the Z80 CPU board. 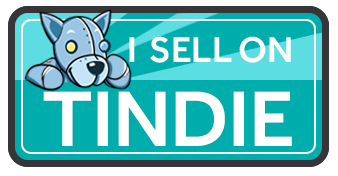 This has little else on there, other than a pullup resistor on the INT line. 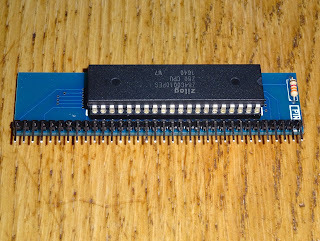 This is an older board, with inputs not passed to the backplane such as NMI, WAIT and BUSRQ tied high, the later versions have an option to tap these off or tie them high. Full details here. Like all of the other modules here, there is no decoupling on the boards, only on the backplane. I'd like to see the traditional 100nF on each chip, I think that has happened on the later modules. 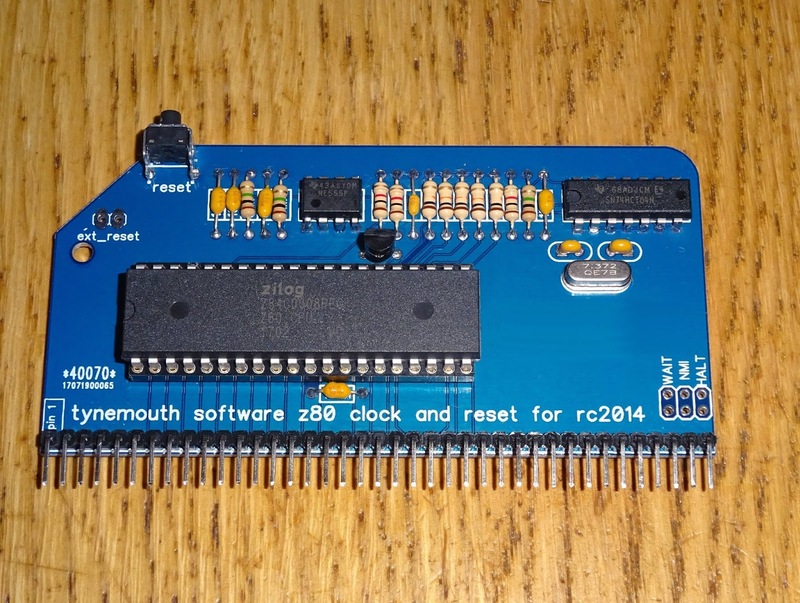 The clock generator comes on a small separate board. This generates a buffered 7.3728MHz clock. I would have thought it logical to place this on the Z80 board, but I guess there are reasons to separate them. There is also a position for a reset switch, but I deviated from the normal build here and added instead an RC circuit to give a power on reset. There is a reset button on the backplane anyway. Here I found a 74LS04 wasn't up to the job, but a 74HCT04 was fine. Full details here. 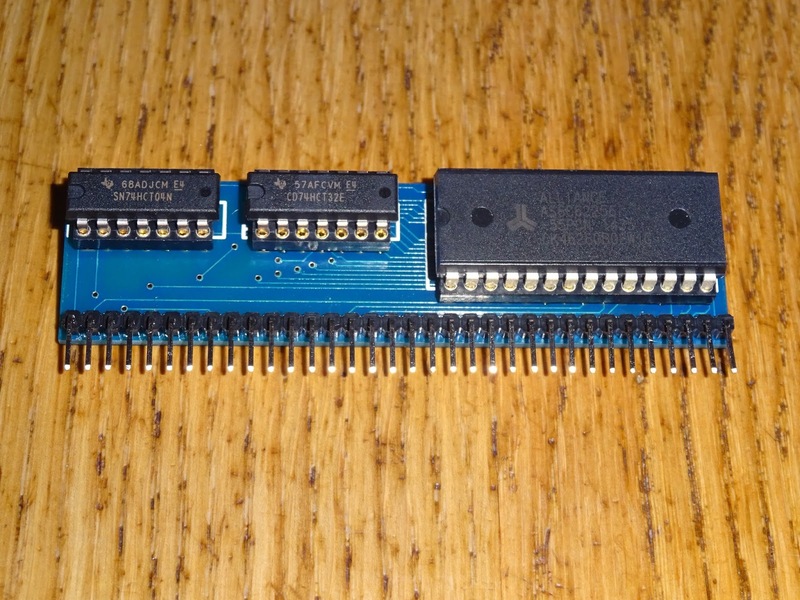 The Z80 needs some code to run, so it gets that from the 8K ROM module. 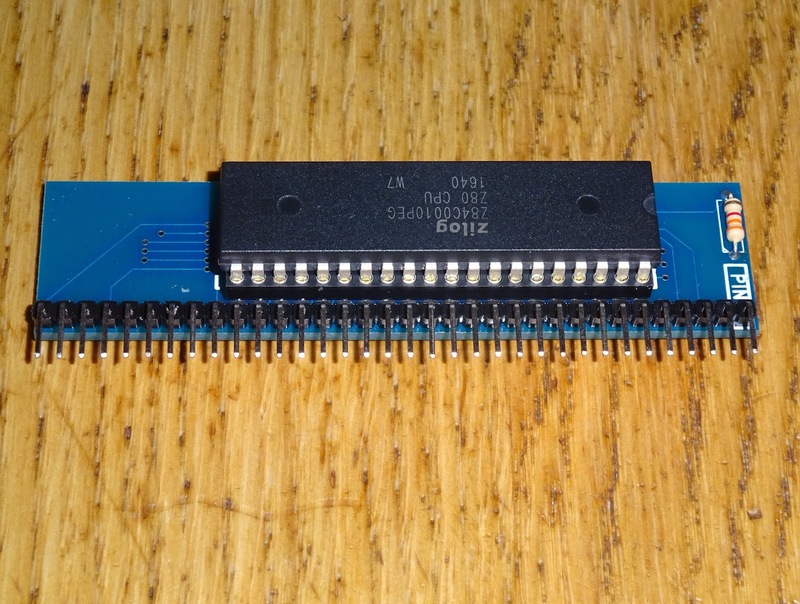 This has a 27C512 EPROM split into 8 banks of 8K, selected by jumpers. Full details here. 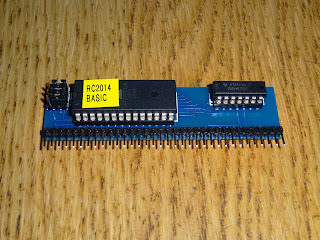 As supplied, it came with a version of BASIC adapted from the NASCOM computer by Grant Searle - more details on his site. 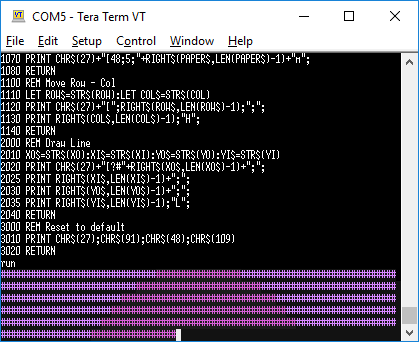 This is fixed 8K ROM decoded to the address range 0x0000 - 1FFF. There is a later module which allows bank paging, which is one of the new ones I have ready to install. 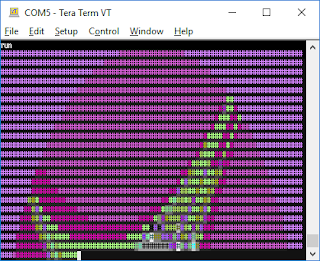 BASIC needs some RAM to run in, so here is 32K of RAM, mapped as 0x8000-FFFF. Again, this is a fixed mapping and a newer board has up to 64K and paging capabilities. 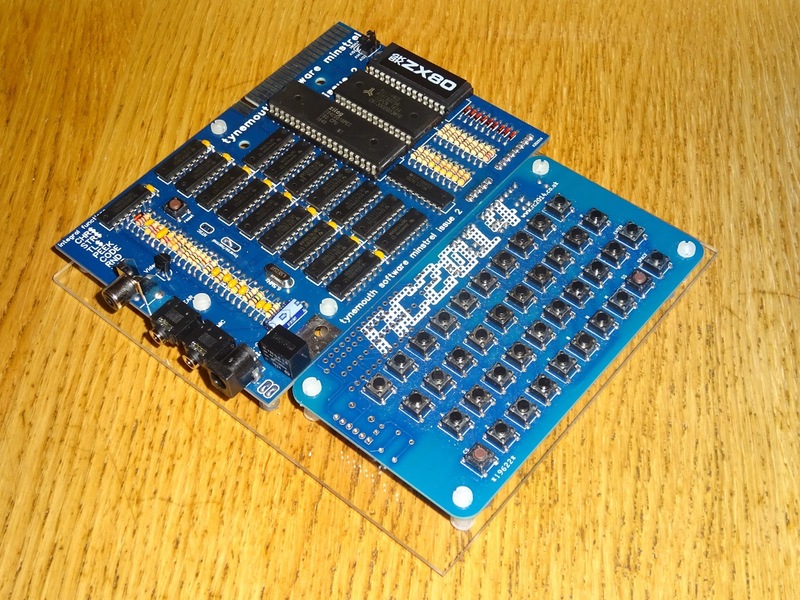 Full details of the 32K RAM board here. 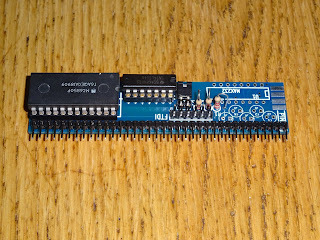 If I remember correctly, this is another one of the boards where I started with a 74LS32 and changed to a 74HCT32 as I found some RAM chips (the Alliance AS6C62256 shown) didn't work with the LS chip, but other 62256 chips were fine. 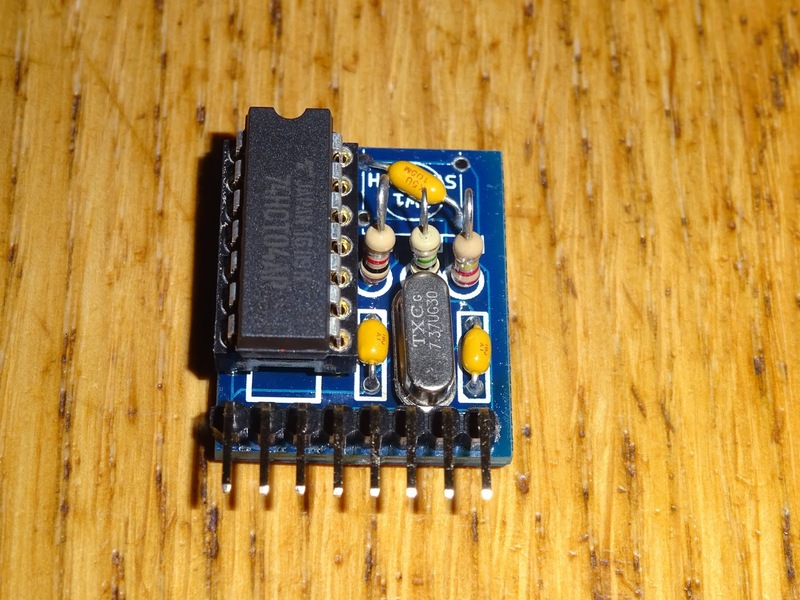 This final module for the BASIC system provides serial IO. This is based on the 6850 (although the 6350 can be used, as can 6xA50 and 6xB50 variants). These are the only part in this system that are out of production, so are old parts, the 68B50 I got didn't work, but I had a 6850 and that worked correctly. The system 7.3728MHz clock is divided down to get the serial baud rate. Divide by 64 gives 115200 baud. 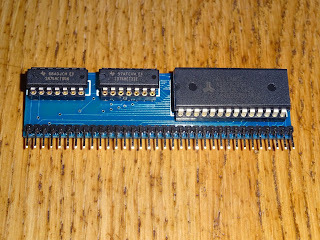 There is space to install a MAX232 and a 9 way D connector for an RS232 compatible port, but the easiest option is to use the FTDI header to connect to a PC via a USB serial adapter. 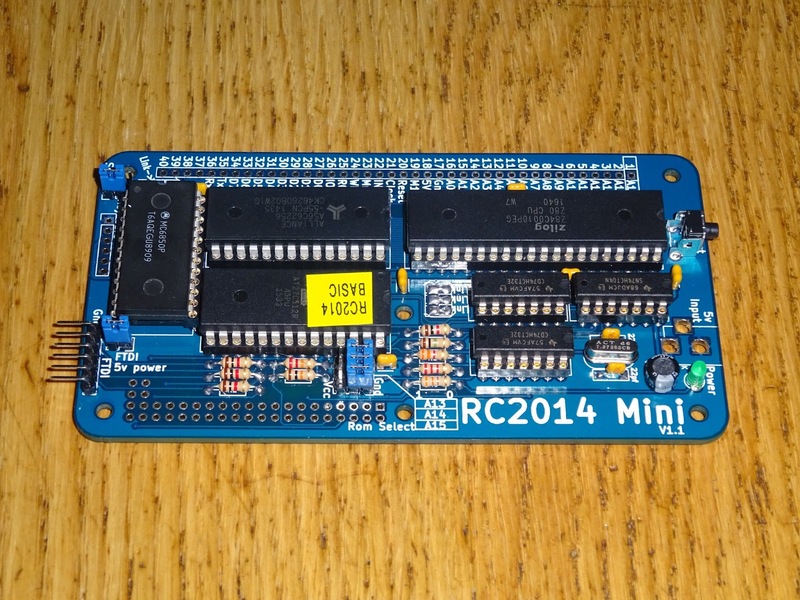 The jumper above also allows the RC2014 to be powered via this connector. The 6850 is accessed at address 0x80 and 0x81 (but is also mirrored from 0x80 through to 0xBF) . Full details here. With all of those plugged in, you can see that two face in the opposite direction to the others. This means the central modules are close, so I have some plastic feet stuck on the back of the RAM card to stop it touching the CPU card. 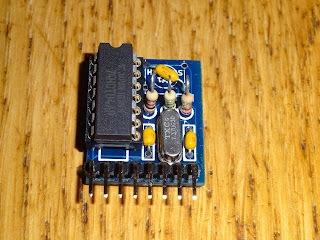 Since all my FTDI cables were bricked by FTDI last year, I am using an Arduino module which does the same job, and that is set to power the whole unit (current consumption is under 200mA, and the USB port can in theory supply up to 500mA). Connecting up via a serial terminal and switching on, we're into BASIC and away. 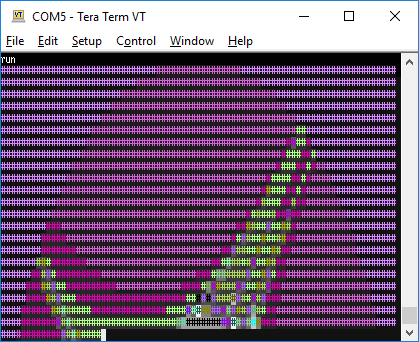 Without adding any storage, the easy way to get programs onto the system is to paste into the terminal Window. I have had mixed results and usually need to get the terminal program to add a 10mS line delay or a 1mS character delay to avoid corruption when transferring large programs, as there is no flow control in place. 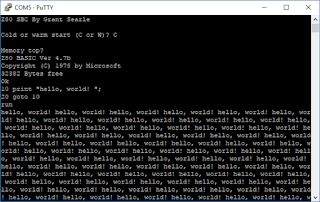 You can then transfer some BASIC programs over to test. 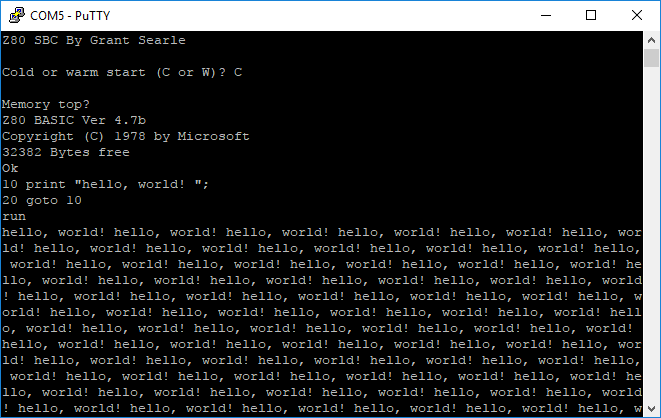 It is a pretty generic Microsoft BASIC with most of the usual commands supported. The great thing with a system like this is that if you find there is something missing, go and grab the source for the BASIC interpretor and add your own commands. 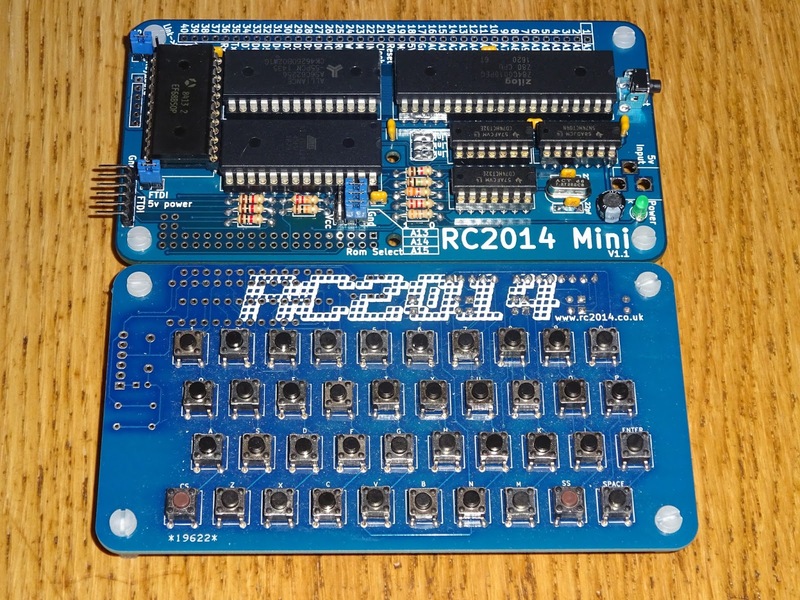 Something else I should probably mention at this point is the RC2014 Mini. This is basically all of the above on a single board. 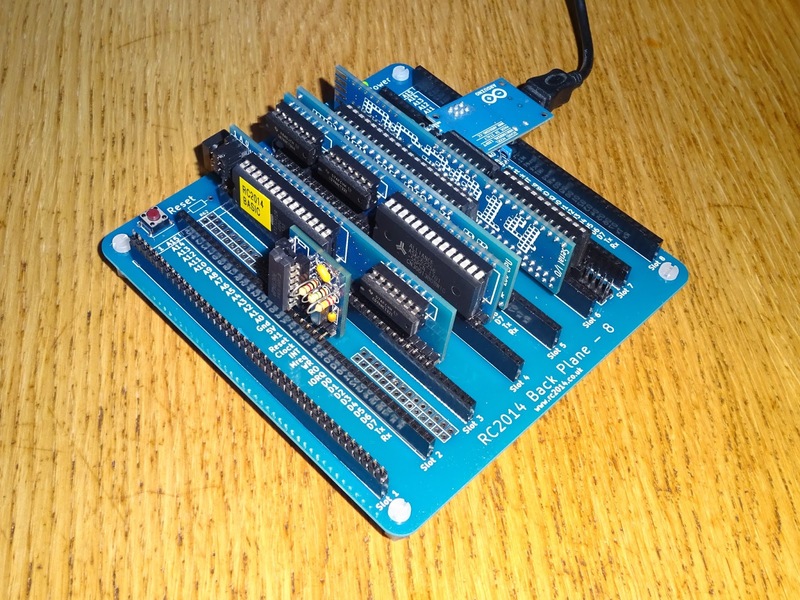 It can be used standalone, of there is space to fit a 40 pin connector on the side to add a single module, or a backplane full of modules. 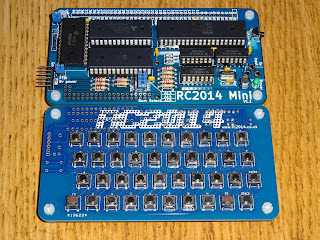 This one is also driven via FTDI serial cable, or you can use the RC2014 Universal Micro Keyboard. That is what that keyboard is meant to be used for, even though I keep using them on my Minstrel ZX80 clones. 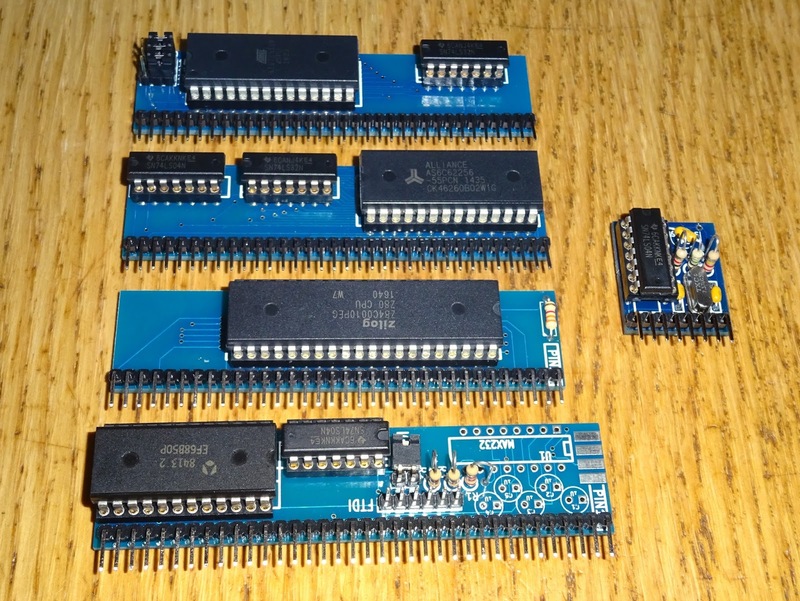 So that's the existing modules I have covered, next time I'll be replacing several of those with new ones. 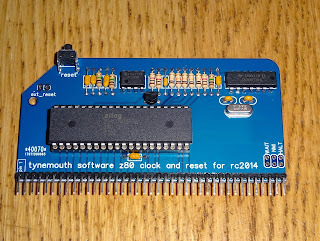 I have added my own module to the range, a combined Z80, clock and reset module.